Forget trying to buy the “right frame!” we will preserve your color photos in crystal! Our unique process will provide years of enjoyment. Your family and friends will truly love receiving your gift. We have a lot selections in size and shape, choose your personal crystal design for your color photo! 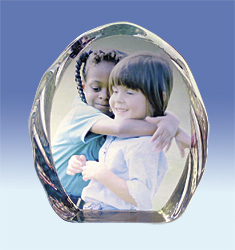 Color photo crystal is a decorative crystal with your personal photo chemically bonded to the crystal’s surface using a special bonding agent. The final product is durable and beautiful and the bonding method will preserve your photo for decades to come.